2016 - Read. Think. Act. (Dec. 26, 2016) Catherine Read is joined by three members of the Board of Directors of Virginians for Alternatives to the Death Penalty: Paul O’Shea, attorney Kristina Leslie, and Nicholas Cote. The impending execution of death row inmate Ricky Gray on January 18, 2017, has brought the issue of capital punishment back into the headlines in Virginia. VADP is a non-profit that has been working to abolish the death penalty in Virginia since 1991. With over 140 death row exonerations in recent years, there is no doubt that innocent people have been both wrongly convicted and wrongly executed by state governments. Some states have abolished use of the death penalty legislatively and others have found ways to avoid executions through commuting death sentences to life without parole. In December 2016, the Delaware Supreme Court ruled that everyone currently on death row in that state will be re-sentenced to life without parole. That ruling stems from their August decision which found the death penalty law is unconstitutional. Recent U.S. Supreme Court decisions have weighed in on the issue of capital punishment as it is applied to juveniles and those who are intellectually disabled. There is still great disparity in how each of the 50 states has structured laws around who may be put to death and how. Most recently, there has been controversy over the method of execution that uses injectable drugs. There have been issues with the performance of these drugs that have prolonged the actual termination of life and that is being challenged as a cruel and unusual punishment. Virginia Governor Terry McAuliffe could commute the sentence of Ricky Gray prior to his execution date on January 18, but there has been no indication that he is considering such a move. Virginia in third in the nation for the number of people executed since 1976. The Death Penalty Information Center has charted those number in the U.S. here. (Dec. 12, 2016) Catherine Read discusses the changes in the nursing profession with Melissa Batchelor Murphy, PhD, RN-BC, FNP-BC. Since Florence Nightingale first introduced nursing as a profession in the 19th century, there has been a steady evolution around what it means to “practice nursing.” There is now a variety of educational pathways, degrees and specialities within the field. Dr. Batchelor-Murphy walks through what the various designations mean and how Advanced Practice Registered Nurses (APRNs) are delivering a great deal of the healthcare among specific populations like those in rural areas and to veterans being served by the Veterans Health Administration. A ruling just this week by the U.S. Department of Veteran Affairs (VA) grants three APRN roles (nurse practitioners, certified nurse-midwives, and clinical nurse specialists) the ability to practice to the full extent of their education and training. There is legislation at both the Federal level and state level to address regulations around what services APRNs may provide without needing a collaborating physician to sign off. Regulations vary from state to state with many states with high rural populations recognizing that a physician shortage in remote areas creates a challenge for delivery of basic health services. As more physicians specialize, the pool of General/Family Practitioners shrinks. Nurses are also increasingly choosing to pursue specialities, although the distribution is uneven. Dr. Batchelor-Murphy who focuses her nursing practice on geriatric patients is part of only 1% of three million nurses nationwide who has chosen to do so. Despite a population hitting age 65 at a rate of 10,000 per day, there are not enough gerontologists to meet the need. Dr. Batchelor-Murphy addresses the challenges of a lack of diversity among nurses, the cost considerations in pursuing a degree in nursing and the shortage of nurse educators in programs around the country. While much is being done to raise the visibility of the nursing profession and to increase the scope of services APRNs are able to provide, there is a long way to go in attracting both men and women of diverse backgrounds to consider the field. (Dec. 5, 2016) Guest House in Alexandria, VA, was founded in 1974 to assist formerly incarcerated women with their transition back into the community. Executive Director Kari Galloway joins host Catherine Read in explaining the services provided to the residents of Guest House and their remarkable success in supporting over 3,000 women in the last 42 years. Joining them in the first segment is former resident Terry Garrett who now speaks to local groups on behalf of this non-profit. In raising awareness of this program, they hope to eventually expand their services to better serve the increasing numbers of women being incarcerated and released here in Northern Virginia. Jessica Rodgers, the Residential Case Manager for Guest House, and a current resident of two months, Monica, join Catherine in the second segment to talk about the benefits of the three month residential program. There are numerous ways in which these women are supported in the first 90 days after their release, including how they support each other. There are three core programs: the one-year Residential-to-Aftercare continuum and the non-residential Outreach Program. Less than 10% of the women who come through Guest House return to jail or prison. Without such support, nearly 70% of previously incarcerated women will return to jail or prison. In Northern Virginia, Guest House is the only group providing reentry support that is both comprehensive (housing, jobs, healthcare and family/community connection) and tailored to women’s unique needs. They continue to seek additional support from agencies, organizations and donors to help expand the services they can provide. Individuals can also support these women through a Target Registry set up to help supply them with basic necessities like toiletries. Most of all these women need JOBS. Finding companies willing to give them employment opportunities is especially key to their successful reentry into our community and Guest House welcomes all suggestions in this regard. (Nov. 14, 2016) Catherine Read interviews author Karen Branan about her recently published book The Family Tree: A Lynching in Georgia, A Legacy of Secrets, and My Search for the Truth. A career journalist born and raised in Georgia, she became aware of a lynching in her family’s hometown of Hamilton through a comment made to her by her grandmother. It took over 25 years for the author to do the deep research necessary to uncover her family’s role in that tragic miscarriage of justice. Having come from a family of six Harris County Sheriffs, Ms. Branan was determined to find the truth of what happened on that fateful January night in 1912. Ms. Branan’s journey is a deeply personal one. Her search into her own family’s history brought into focus the social, political and economic climate of the South that formed the backdrop for the series of events leading up to this lynching. One of the great strengths of her book is the well researched history that gives the central story some context. She was surprised to find the complex connections that existed in her family tree. In this interview she talks about recent DNA testing that has connected her to her African-American cousins in Harris County, Georgia. This is an epic family drama at its core. In searching for the truth of what transpired at the Hamilton jail on that fateful night over 100 years ago, she had to address her own racism, the sense of responsibility for a great-grandfather who did not do his job in protecting those entrusted to his keeping, and the impact that decision made in that community. Ms. Branan talks frankly in this interview about feeling that some acknowledgement needs to be made for the wrongs done to the African-American community. She understands the Black Lives Matter movement in the context of centuries of injustice done to generations of black Americans. Her own research, on so personal a level, has brought her face to face with her family’s role in the racial injustice perpetuated to this day. This is a candid and thoughtful perspective on a dark aspect of our country’s history. I highly recommend reading her book The Family Tree. 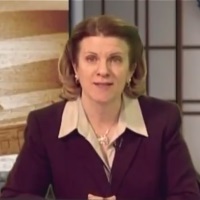 (Nov. 7, 2016) Catherine Read speaks with well known political pundit Ben Tribbett on the eve of the 2016 presidential election pitting Hillary Clinton against Donald Trump. Known by many as @NotLarrySabato on Twitter, Ben has been blogging and prognosticating about elections since his high school days. A native of Virginia, he has been involved in numerous elections at a national, state and local level. This election season he is involved with a number of campaigns in various capacities and he takes time out to talk about the races of greatest interest to voters across Virginia. In addition to the top of the ticket race, there are 11 Congressional seats in Virginia that will be decided as well. One of the most closely watched races is between two women candidates in Virginia’s 10th CD: incumbent Barbara Comstock (R) and challenger LuAnn Bennett (D). There is an open seat in the 5th CD with VA Senator Thomas Garrett (R) facing off against Jane Dittmar (D), and another open seat in the 4th CD where VA Senator Donald McEachin (D) is facing off against Mike Wade (R). Another closely watched race is for the Mayor of Richmond which has three candidates at the top of a field of eight candidates vying for the top spot: Joe Morrissey, Jack Berry and Levar Stoney. Locally we have a Meals Tax on the ballot in Fairfax County, and statewide, there is a Right to Work amendment to the Virginia Constitution on the ballot. Should Tim Kaine become Vice President on Nov. 8th, there is a potential for an appointment that could cause a ripple affect among other elected offices elsewhere in the state. There is a great deal of speculation on who Gov. Terry McAuliffe might appoint to fill a U.S. Senate vacancy and who might be running to fill that seat in November of 2017. Virginia is one of only two states with “off year” Governor’s races which means our voters and those in New Jersey will be facing major elections again next year. There will be primaries in June to determine the candidates for Governor, Lt. Governor and Attorney General for the 2017 election. Ben gives us his well thought out predictions on what might happen in these races and who we should keep our eye on. (Sept. 12, 2016) In the second show in a series on Virginia’s School to Prison Pipeline, Catherine Read explores the constitutional rights of children in school. Her guests include Juliet Hiznay, an attorney who has represented families with special needs children for many years; Melinda VanLowe, a trial attorney based in Fairfax who represents children engaged with the criminal justice system; and Leslie Mehta, Legal Director for the Virginia ACLU. The show delves in to how Virginia became the #1 state in the nation for students referred to the criminal justice system. Data released by the Center for Public Integrity shows that of those children referred, African-American children and children with disabilities are disproportionately represented. Children with disabilities are referred at a rate of 33.4 per 1000 students despite the fact that they make up only 13.4% of the entire student population of Virginia. Leslie Mehta of the Virginia American Civil Liberties Union (ACLU) discusses a recent case filed with the U.S. Department of Education’s Office of Civil Rights on behalf of two students in the Richmond Public School System who are African-American and have intellectual disabilities. The treatment of these two students is indicative of a broken system of student discipline that the VA ACLU, the Richmond NAACP and the Richmond Legal Aid Justice Center want to see addressed and reformed. Juliet Hiznay discusses the negative impact of the “Zero Tolerance Policy” ushered into the public school system with the best of intentions that has resulted in an escalation of school discipline problems into criminal justice referrals. The numbers in Virginia are staggering, with over 700 disciplinary referrals per school day, and 20% of those school suspensions affecting elementary school children. Ms. Hiznay also highlights a private consulting company that actually trains school personnel in the interrogation of school children. These widely accepted ideas are creating school environments that mirror far to closely those of a prison. The vast majority of Virginians would not believe that their state could top this list nationwide of children being referred to the criminal justice system. Most adults have a limited knowledge of their own school system and what goes on there. This is where research, data collection and identification of patterns and practices becomes vital in understanding a pervasive problem that is not immediately evident. Inside Scoop will continue with this series on Virginia’s School to Prison Pipeline as we follow what local, state and national agencies are doing to address and resolve the root causes of this culture shift that is impacting the futures of school children across the Commonwealth. This book is about finding a way forward through reconciliation. Kristen Green writes a compelling book about a tragic and terrible part of Virginia’s history. 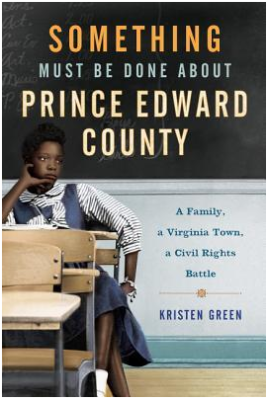 There are many Virginians who don’t know the story of what happened in Prince Edward County or that plaintiffs from Moton High School were part of the Brown v. Board of Education case decided by the Supreme Court in 1954 that declared school segregation to be unconstitutional. The author discovered that her grandfather was instrumental in the massive resistance movement that closed all the public schools and created a whites only private academy. Black school children were shut out of getting a public education from 1959 to 1964 while Green’s own parents attended the private all white academy funded by “tuition grants” paid out of county tax money. Her own education and that of her brothers was also in that same private academy. Her sense of guilt and her search for meaning is palpable throughout the entire book. I believe that in researching and writing this book, she is engaging in an act of atonement. For those who have seen the Civil Rights memorial at the Virginia State Capitol, just a short distance from the Governor’s Mansion, you will recognize the name Barbara Johns who led a student walkout at Moton High School in 1951. The former Robert Russa Moton High School is now a Civil Rights Museum in Farmville – the only Civil Rights museum in Virginia. Quite ironically, the only Vice-Presidential debate between Tim Kaine and Mike Pence will be held at Longwood University on Oct. 4th, just down the street from the Moton Museum. (Aug. 22, 2016) Catherine Read examines the challenges facing LGBTQ students as they prepare to return to school in September. Recent cases regarding transgender bathroom policies in Fairfax County, Gloucester County, Stafford County and Grayson County have left Virginia students and families with a great deal of anxiety. In the first segment, Pat Hynes of the Fairfax County School Board outlines the policies put into place in FCPS school policy recognizing sexual orientation and gender identity as categories that join others as being protected from discriminatory treatment. She discusses the goals of the school board to protect the rights, privacy and safety of some of the most vulnerable students in our schools – transgender children. Robert Rigby joins Catherine in the second segment to discuss the organization he founded to meet the needs of LGBT teachers, “FCPS Pride.” As an out gay teacher, he has sought to provide information and support for other teachers and school staff, and that effort has now grown to include many more people in the community. Robert has become a key organizer in galvanizing support among many interested constituencies in the fight for stronger protections for the LGBTQ student population in Fairfax County and beyond. In the third segment, Marianne Vakiener, an LGBT Ally and parent of two FCPS graduates, talks about her support for better education on human sexuality that goes back to the 1970s. As a tutor and educator, Marianne has spent decades in front of students teaching them many things in addition to academics. As a Unitarian Universalist, she teaches a program called “Our Whole Lives: Lifespan Sexuality Eduction” (OWL) that includes accurate information about the LGBTQ community. She has great stories to tell that illustrate the challenges faced by students on a daily basis. Bianca Rey, a trans advocate, joins Catherine in the final segment of the show. Originally from the Philippines and educated there, Bianca talks about her transition as a child and how she was supported by her school and her family. She lives in Northern Virginia, has a job, recently became an American citizen and is in a supportive relationship. She is party of the Equality Virginia Transgender Advocacy Speakers Bureau and is available to speak to groups who are interested in knowing more about issues related to the transgender community.